Magic Number: This tells the EA to apply partial close to orders only with certain magic number you choose. If this value is set to zero, the EA will manage only manually opened orders. If you set this to -1 (negative one), the EA will manage all of the orders running on the account (default value). Partial Close Count: This tells the EA to apply partial close X times. 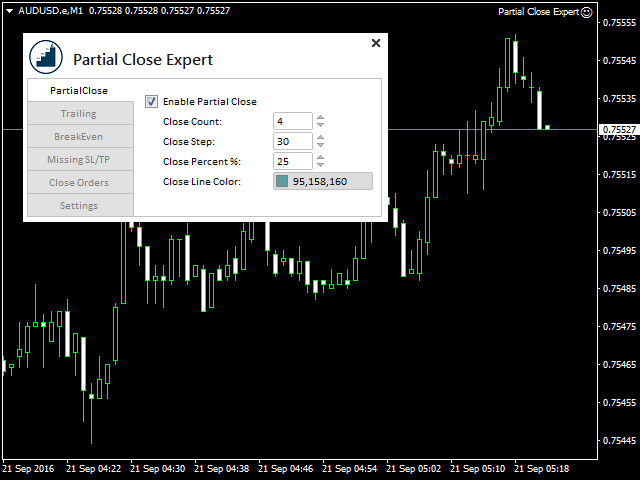 Partial Close Step Pips: This tells the EA to apply partial close each X pips in profit. If this option is set to 20 pips and Partial Close Count=3, then EA will apply partial close 3 times every 20 pips. This means TP1 = 20 pips, TP2 = 40 pips and TP3 = 60 pips. EA will draw a horizontal line on each target. Partial Close Lot Step Percent: This tells EA to close X% of the trade. Percentage of the lot size is counted from the initial lot size. Break Even Step: This indicates after how many Pips EA should move stop loss to a break-even point. Break Even Pips: (open price + few pips to cover commission expenses). Trailing Stop Pips: This tells the EA to move Stop Loss each X pips in profit. Missing stop Pips: If Stop Loss is missing then Stop Loss will be added using X pips. Missing Take Profit Pips: If Take Profit is missing then Take Profit will be added using X pips. Close At Profit close all trade after "X" $ Profit. Close At Loss close all trade after "X" $ Loss. Show\Hide Inputs Panel The Button you Can use it to show or hide the panel. Add Close At Profit Function. Add Close At Loss Function. Added Apply On Symbol function to apply on current symbol orders or apply for all symbols.